CRAZY COOL GROOVY!!! : OVERSEAS ELITE WINS 2018 TBT CHAMPIONSHIP!!! CCG CONGRATULATIONS to General Manager MATT MORRISON, Head Coach MARC HUGHES, and Team OVERSEAS ELITE for Friday, August 3 defeating Team BERLIN DRIVE 70 -58 at The FIELDHOUSE At MORGAN STATE UNIVERSITY in BALTIMORE, MD, to win the THE BASKETBALL TOURNAMENT (TBT) CHAMPIONSHIP 2018!!! 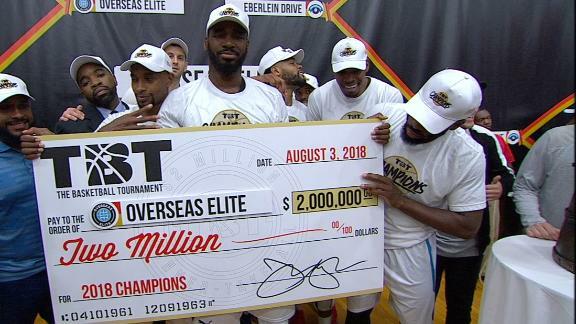 For winning the 2018 TBT Title, OVERSEAS ELITE takes home a cool $2 Million. 2018 marks the fourth consecutive TBT Championship for OVERSEAS ELITE and because the tournament is single-elimination, they have amassed an overall TBT record of 25 - 0 with total winnings of $7 Million.